There are many types of trails – rail trails, canal trails, single-track trails, jeep trails, etc. Altis Endurance events utilize all types of trails. Most races are conducted on trails that are paved or have an excellent crushed stone surface. Trail specifics for each Altis Endurance race are listed in the information provided for each event. Altis Endurance LLC has been started by Frank Dembia and Mike Samuelson to provide quality running events and exceptional products to the running and fitness community. Friends for 30 years now, Frank and Mike met at the United States Naval Academy in 1988. After three years serving together on board a US Navy destroyer, they took full advantage of shore duty in San Diego and started some serious running! Frank and Mike ran their first marathon together in 1994. The duo have completed more than a dozen marathons and ultramarathons together in the intervening years, including crewing for each other on occasion. When their career paths went in different directions, Frank settled into a comfortable routine of recreational running with occasional marathons. Mike’s definition of “recreational running” was a little different! Mike has completed more than 300 marathons and ultras which includes twenty-three 100 mile races. In the summer of 2012, Mike achieved a long time goal by successfully completing a Run Across America that he planned and organized; running an incredible 3,302 miles in 80 consecutive days – an average of 41 miles every single day with no rest days! 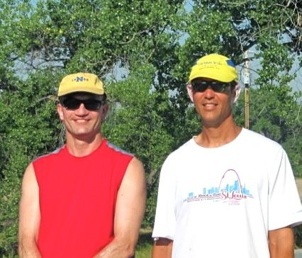 Always passionate about sharing the sport with others, Frank and Mike first started organizing and directing races while still in the Navy with the Surface Line Week 10K. Mike (aka Scorekeeper) has continued in recent years, directing the SwampStomper 25K/50K from 2010-2013 and the Bartlett Park Ultras from 2007-2013. Now, in 2018, Altis Endurance Sports is celebrating it’s fifth year of bringing scenic, challenging and fun trail running events to thousands of running enthusiasts of all abilities and experience levels. We have thoroughly enjoyed being a part of the running community for over twenty five years, and we are excited to meet even more new running friends at Altis Endurance races! We’ll see you all on the trails! Be sure to follow Altis on Facebook and Twitter…just click the pictures below!